Please enter your zip code and select a radius to find a Leo's Coney Island near you. August 20, 2018 Leo's Coney Island is now open in Flint at E. Court St and Center Rd. April 27, 2018 Leo's Coney Island Launches New Website! 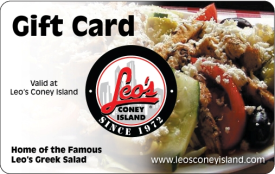 Official gift cards available for purchase at your local Leo's Coney Island.